Extra Large "SAME P FOREVER" Banner that will stand out and make your party rock. 7.8 inch tall letters. About 5m/16ft gold ribbon allows you to adjust the banner for any place or split it in two. 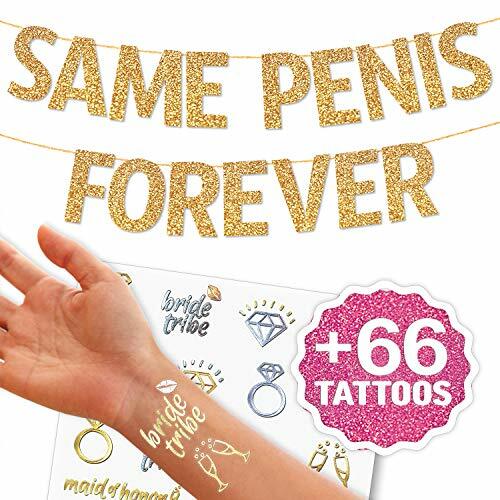 Bonus: 33 Bachelorette Party Metallic Flash Tattoos (2 Sheets). Long lasting gold and silver flash tattoos. A perfect party accessory for the bride to be and her tribe. No Assembly Required. The banner is pre-strung, just get it out of the package and it's ready to be hanged. Perfect for bachelorette party, hen party, hen day, hen night, hen do, hen weekend and bride to be wedding bridal shower. The Banner made of high quality gold glitter 300gr hard card stock that won't fold and can be reused. We strive to provide our customers with only the finest products in addition to the most attentive service possible. We even offer a full money back guarantee on this banner. So don't delay. Order today!